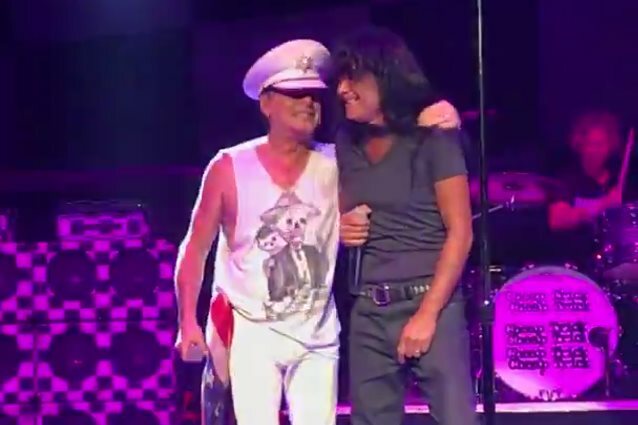 ANTHRAX singer Joey Belladonna joined CHEAP TRICK on stage on July 11 at Lakeview Amphitheater in Syracuse, New York to perform the classic CHEAP TRICK song "Surrender". Fan-filmed video footage of his appearance can be seen below. Joey is not the first ANTHRAX member to play with CHEAP TRICK. Last October, ANTHRAX guitarist Scott Ian got to live out a dream when he joined the legendary rockers on stage at the at the Louder Than Life festival in Lousville, Kentucky to perform the track "Auf Wiedersehen". ANTHRAX recorded a version of "Auf Wiedersehen" in 1992 during the sessions for the "Sound Of White Noise" album. They also covered CHEAP TRICK's "Big Eyes" on the "Anthems" EP, which came out in 2013. "We were toying around with the idea of doing a CHEAP TRICK song, and 'Big Eyes' was one of our favorites," ANTHRAX drummer Charlie Benante stated at the time of the EP's release. "We recorded it, but then got busy with other things, so we never finished it. What happened was, Joey was out in L.A. doing vocals for the EP and Jay Ruston [co-producer] pulled 'Big Eyes' up and had Joey do the vocals, something we didn't know he was going to do. But it turned out so great. Joey's vocals are so amazing, so we knew we wanted the song on the EP. After Joey's vocals, all the song needed was a guitar lead, and I did that in my Chicago studio. I think the song turned out to be one of the best songs on the EP. "Everyone in the band is a huge CHEAP TRICK fan. They were one of the first concerts I went to, probably in 1978 when I was living in New York. I saw them at the Palladium." ANTHRAX is continuing to tour in support of its latest album, 2016's "For All Kings", which sold 34,000 copies in the United States in its first week of release to land at position No. 9 on The Billboard 200 chart.